Studies show that by creating a polished appearance people can increase their business success by projecting poise and confidence. 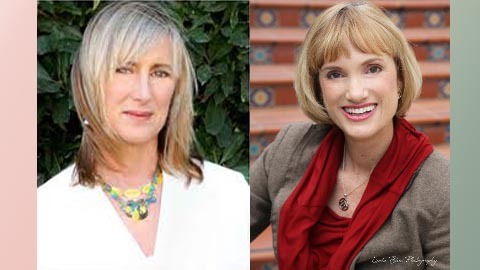 To help you fine-tune your image AWC-SB presents Image, Success, and Self-Confidence with Professional Image Consultant Valerie Burns and Jewelry Consultant Calla Gold on Wednesday, May 1, 5:30- 7:30 pm at Antioch University Santa Barbara, Community Hall. Free to AWC-SB members, $20 nonmembers. Valerie Burns is a leading Image Consultant whose creativity produces transformations that drive personal and business success. Her keen style sense and sharp attention to detail, along with business savvy and excellent communication skills, make Valerie a sought-after corporate image coach. Calla Gold helps her clients select jewelry that fits their distinct lifestyle, career, face and body shapes. Come learn how magical things happen when color, function, balance, and style come together. If you would like specific tips from Valerie and Calla, come dressed as you would for a speaking engagement or client meeting. Valerie Burns provides a range of consulting services to help her clients develop a customized professional style, regardless of age, shape, or occupation. She yearns to inspire transformation, encourage empowerment, and create delight. Valerie’s distinctive approach comes from a combination of her design training and professional experience. A style authority for more than 20 years, she draws on her degrees in fashion merchandising and interior design plus a background in management. She has served as a freelance wardrobe stylist in Hollywood to top celebrity clients and provided wardrobe consulting for numerous high-end retail establishments, individuals, organizations and companies. Calla Gold, a “Jeweler without Walls” since 1983, specializes in custom design, wedding rings, jewelry restoration and re-purposing. Calla believes everybody is a jewelry designer, as long as they have an expert to show them style ideas. She speaks at events on jewelry education topics like “Discover your best look” and speaks to business groups as an expert in sales, business and marketing. Two years ago she took her “Jewelry without Walls” gems of web wisdom to the social web to boost her business. Now her friends call her a “weblebrity” due to her growing business page of over 1,100 fans on Facebook, her celebrated eBook The Language of Jewelry Design, and her blog. This entry was posted in Past Events and tagged Calla Gold, Valerie Burns on April 16, 2013 by Lisa.